CoS Readers' Poll: What's Your Favorite Beatles Song? . Beatles Radio: The Beatles, Solos, Covers, Birthdays, News The Fab 4 and More! CoS Readers' Poll: What's Your Favorite Beatles Song? 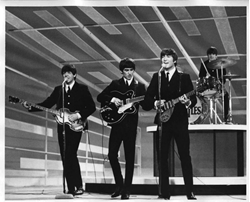 On this day in 1964, The Beatles made their historic debut on The Ed Sullivan Show, performing a set that included “All My Loving” and “She Loves You” in front of a national audience. To celebrate, we want to know your favorite Beatles songs of all time. Of course, Paul McCartney, John Lennon, George Harrison, and Ringo Starr each had their own respective hits after the break-up of the band, but we’re focusing on songs released by the collective group. It’s hard to argue against some of The Beatles’ classic hits like “Here Comes the Sun”, “Come Together”, “Let It Be”, “Yesterday”, or “Hey Jude” (to name just a few), but their deep cuts feature no shortage of gems, either.